Oops. It's been four weeks since last I typed here! Well, never mind all that, nothing really important happened except a job search. And I don't want to type about that. I am always trying to get myself to draw more often, and I always do good for a little while, then fizzle and quit. A few months or years later I try again. November is National Novel Writing Month in which members try to write 50,000 words of a novel. I often participate in the art version, Art by the Inch, altho that website has been defunct for years now. My art goal has always been to make a full (letter size) page of art every day for the month. To be honest, it exhausts me, and at the end of the month I don't want to see any more art, let alone make any! I take a vacation from art and I never get back to it. So, a full page of art is too much, right? How about postcard sized art? hm! I bought 4x6 index cards, and when I feel like drawing I just pull one out. I started this endeavor 15 October, and I haven't drawn every day, but I'm happy with what I've got so far. The Happy Pig, above, is my favorite one so far. 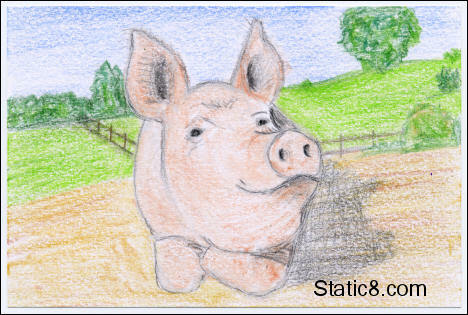 I drew her from the Farm Sanctuary newsletter. Since they rescued 68 pigs during the flooding in Iowa this summer, their newsletters have been filled with the cutest photos of pigs! Anyway, I think I really enjoy the 4x6 format for my art... When I experiment and it's a failure it's not a big deal. When the art does work, it's still big enough to look good. I can spend time filling in details, and it's not going to take all day. And all the artwork fits perfectly into a photo album for easy viewing. I went looking today to see if anyone had revived the Art by the Inch concept... and on the NaNoWriMo subforum "NaNo Rebels" I discovered a thread called NaNoDRAWMo. These people have enough moxie to do 50,000 words plus daily drawing! ha! Barlidoc set up an LJ for the crazy people and I've joined (tho I won't be writing!). LJ: nanodrawmo, a very small group so far, I'm member number 7!